Subject: Plate : 'The First of September, Morning'. 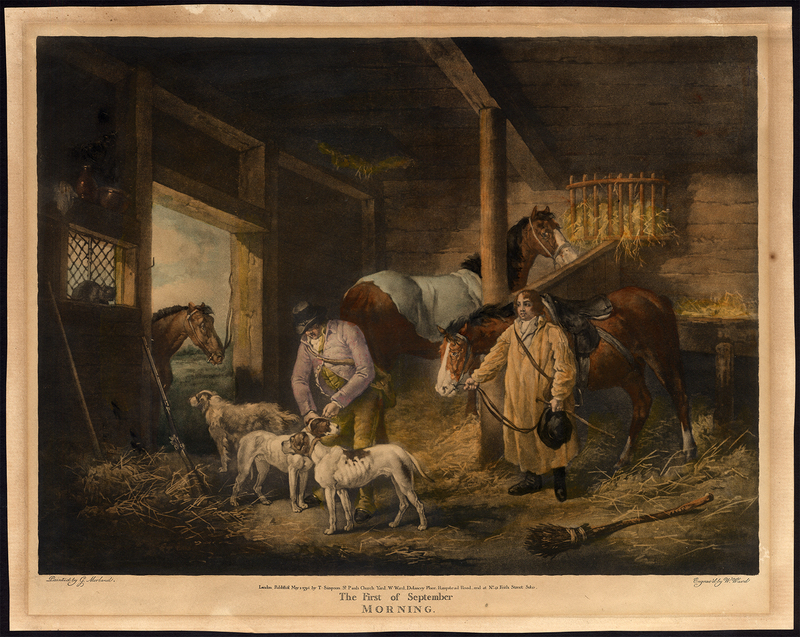 English country life interior scene, a stable, with men, dogs and horses; a man tying a collar on a dog, his gun resting against the wall, a horse behind him, another tethered outside, and a third standing ready with a man in a smock leading it by the bridle. Condition: Good. General age-related toning and light staining/soiling from handling as visible on image. Small tear top edge, not affecting image. Margins browned with a few spots. Please study scan carefully. Medium: Facsimile of a handcoloured mezzotint. Size (in cm): The overall size is ca. 51.5 x 41 cm. The image size is ca. 48 x 35 cm. Size (in inch): The overall size is ca. 20.3 x 16.1 inch. The image size is ca. 18.9 x 13.8 inch. Description: Late 19th century facsimile printing of a mezzotint that was originally published in London, dated 1794. Artists and Engravers: This plate engraved by W. Ward after G. Morland. William Ward (1762-1826) was an English engraver. During his lifetime he was appointed engraver to the Duke of York, and associate engraver to the Royal Academy. He not only worked closely with George Morland, but also married Morland's sister Maria. George Morland (1763-1804) was an English painter of animals and rustic scenes. He was born in London, third son of Henry Robert Morland. His father, artist, engraver and picture restorer. Morland's work in painting is characterised by the simple subjects he painted. He depicted the life he knew from his own experience. Morland worked closely with William and James Ward, and later married their sister Anne.